The real good time to learn was both by watching yourself and watching other guys in the film review session after every game and every practice. Everything you did the day before, you really learned a lot by watching. You’d find out what everyone did right and wrong. In Jim Collins’ book Good to Great technology played only a limited role in corporate springboards to greatness. And I may have said it once already, but it bears mentioning again: the Great 60 & 3 era was in large part accomplished by the oldest technology in the books. Namely, the human body, mind and spirit. But I would be remiss if not bringing up one last facet of technological innovation that acted as a force multiplier during that time: digital video. In this present day many of us take for granted our computers and 4G phones and vast video streaming capabilities of the internet. But not so in 1993, for it was merely a glint in some code-writer’s eye, a few years before the whole dot.com frenzy and pop. Back then the tool of the trade was the old film projector, what with all the splicing and dicing and grainy, out-of-focus shots projected onto a darkened South Stadium meeting room’s wall. 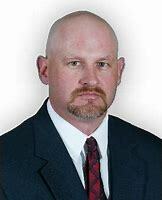 But there was a change in the air, and Nebraska Football -an early adopter via the leadership of Director of Video Operations Dave Finn- had an ace or two up its sleeve. Those trumping aces were Bryan “Carp” Carpenter and Brian “Moose” Mohnsen, both former players and graduate coaching assistants whose film room exploits played a larger role in game preparation than you could ever imagine. To my great enjoyment, I tracked one of them down, Carp being kind enough to take little stroll down the digital memory lane with me. Dispelling some notions, embellishing others, and sharing his unique thoughts on what made that greatness possible, let’s roll the film… er, digital video. Question: Now, you were from Olathe, Kansas, right? 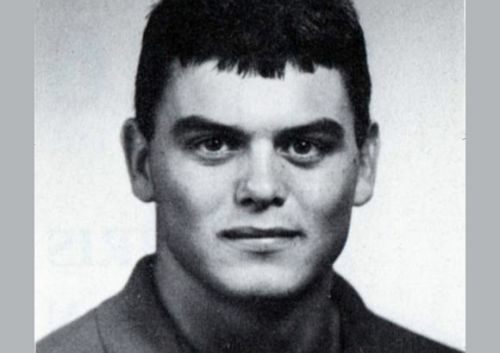 Was it in 1988 that you joined Nebraska as a fullback? Bryan Carpenter: It was ’87. I joined as a juco transfer. I had three years left to play because I was in a juco for one year. Q: So did you graduate high school in ’86? BC: It was ’85. It was a weird deal. I had a scholarship and came up here, then I left and went home. Q: You missed your wife, who was your girlfriend at the time? Charlie McBride recruited me both times, and I liked that a lot. A good guy. You know, the first time around it was a little different because they really recruit your parents & encourage your parents to come up and see for themselves, and a lot of parents did that. It’s a real family thing: “The door is always kind of open, we’ll treat your kid with respect and be another parent,” you know? That was one of the big things that did a lot of good there, and your parents felt really good about where you were going, that you were being treated fairly. Q: Sure. Somebody was there to watch your back or keep you in line or be a shoulder to cry on if you needed one? BC: Yeah. And the second time around it was more, “We need you to come up here,” since I was a fullback, though was an I-back the first time. I was playing halfback in the junior college wishbone, but then the fullback got hurt the first game of the season, so they needed somebody to play fullback and I kind of volunteered. (Mostly because you get the ball a little bit more, in the wishbone it’s a fun position to play.) So I switched to the fullback spot and they were looking to run some triple option. They ran the option here, but they didn’t always run it like the wishbone where you read the tackle -you know?- the true triple option. They were looking to start doing that, so they were looking at trying to find different type of fullback, I think. They had the type of bigger guys, but now they were beginning to look at guys who were maybe a little bit more quicker. I guess they were willing to give up maybe a little more blocking in order to run the triple option that way. So that’s why they recruited me again. Charlie came and it wasn’t the same deal with my parents there and all, so he came down on a trip and said, “Hey, we want you to come and play for us. We think you can play.” I was a couple years more mature, I guess. (laughs) I realized it was a pretty good opportunity to not pass up, so I came back. You know the rest of the story. It was a good experience. I don’t think I ever would have wanted to go anywhere else. Q: So did you become a student or a Grad Assistant after ’89, your last year playing? BC: I was a Grad Assistant in ’91. After moving to Overland Park for a short time in ’90, I wanted to try and get into coaching. I talked to Frank and Coach Osborne and all that, but they just didn’t have a spot. They had all the GA spots full, so I went back to Kansas City and maybe two months later I get a call from Coach Osborne and they had a spot. Turner Gill had left and he got an assistant coach’s job at North Texas or somewhere like that, and they asked if I had any interest in coming back, which I did. I was a GA for a short time and then I got into the video department. Q: If memory serves, you were an offensive assistant, right? BC: I worked with Frank, with the running backs. It was a pretty good deal. I got a chance to help coach some of the younger guys at the time: guys like Jeff Makovicka, Cory Schlesinger, Andre McDuffy, Scotty Baldwin and some of those guys. (laughs) I don’t know if you remember Floyd Sorely and those guys in film? Well, he retired and they were looking for someone to film and do some of the editing and things, so they asked if I had the interest in that and I decided to do it. So I just kind of stayed. Q: What year did you make that move? BC: Let’s see: in ’91 I was the GA, ’92 I kind of helped out in the office up there a little bit, with stuff, different things. I guess it was ’93 I started working in the video department, officially. It was ’93, I guess. Q: Did you and Moose (Brian Mohnsen) both join the video staff at the same time? BC: No, Moose was an Undergrad Assistant. He was a linebacker, and I think he had bad knees. I think he was a walk-on guy, and they were able to put him on scholarship as a Student Assistant, kind of a medical kind of thing that last year of his eligibility. So they let that go by and he helped coach, what they kind of called an Undergrad Assistant. He did that when I was a Graduate Assistant. In ’92 I think he replaced Tony Davis and got hired full time, and that was Floyd’s last year when I replaced Floyd. So Moose was actually one season ahead of me as far as working in the video department full-time. Q: Can you describe what your position title was? What your official function was? BC: I’m trying to think, I guess it was probably Video Assistant for the Offensive side of the ball or something. I filmed all the practices, all the games, and part of my responsibility was to enter all the data for all of the film breakdown. Moose worked the defensive side. It was just the breakdown of film for the opponent’s defense, edited all that information and editing all the film, help with the game planning as far as giving them a lot of reports, getting the video and doing the editing for certain types of situations that your opponents run. You know, tendencies and all of that. The coaches would look at all of that and get together and game-plan on Sunday, so the week before you were always working on the opponent you were going to playing, sometimes two weeks ahead. So I did that, and every day I filmed practice and edited the practice film, that kind of thing. And then Dave Finn retired and they moved us to the co-Video Coordinator position, so we coordinated all the filming. I still filmed the games and all that, but I helped the staff coordinate some things during the game and had students working under us and filming for us. And when they hired Bill Callahan and he came in, Moose got out of there pretty quick. (laughs) He found a job coaching down at Northwest Oklahoma State and I’d stayed there in the position of Video Coordinator for about eight months for Bill, but I just didn’t really care for it that much. It had just kind of changed from the old open-door policy. Any time you ever wanted to go talk to Coach Osborne, he had time to do it. And any of the other coaches, too, for that matter. They kind of seemed to care about all the people who worked there, and that all kind of changed when those guys came in. It was just kind of different, it felt like it changed. That didn’t necessarily mean the guys were all bad people, it was just different. 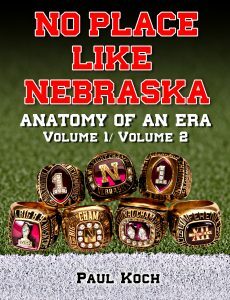 BC: Yeah, one of the things, there were so many little things that Coach Osborne did. We had the adidas shoe contract for the athletic department. A lot of schools, the head coach gets the big chunk of that because it’s part of their deal. Well, he split that whole thing up with all the assistant coaches, all the way down to guys like Moose and I. We had a certain amount of dollars we could spend in ‘adidas money’, you know? And then Christmas time would come around and he’d give you a check as well as a gift. He’d write out a check, give you like a hundred bucks. And if you had kids he’d add something for every member of your family. It was a personal check from him and a card that was personally written out by him. 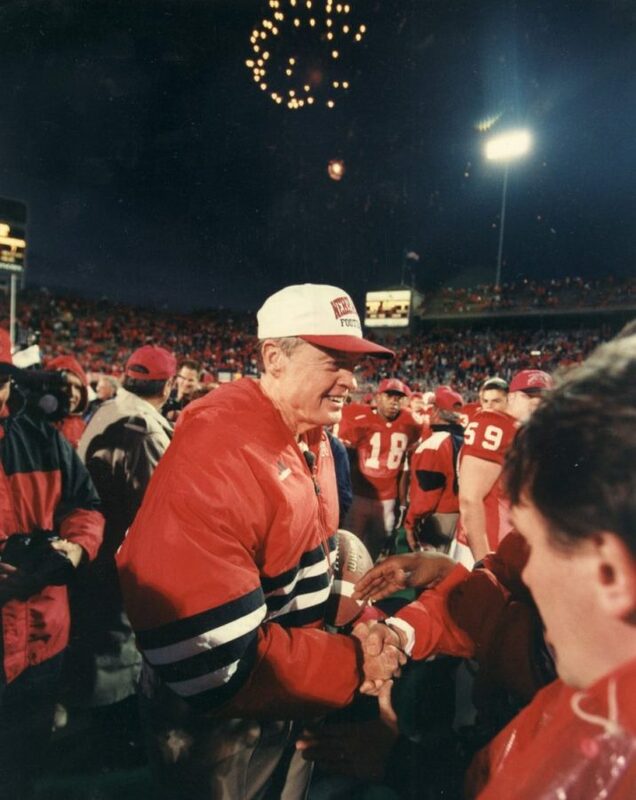 He made sure that we always got all the gifts for every bowl game and anything possible, because I think he realized that it took everybody to accomplish what they were doing. And he did that all the way down to -I think- the Student Managers and trainers and all of those guys. They all got taken care of pretty well. It just made it nice. I enjoyed going there every day. I don’t think there was a single day I didn’t want to go to work, you know? Even if there were long, crazy hours, I didn’t mind being there. Q: It’s still came down to execution, right? Q: When you and Moose were operating in your respective offensive and defensive capacities, I have a feeling your knowledge of the terminologies, the calls, the jargon, really helped with efficiency? BC: Yeah, we were kind of different when you’d go out and compare what other schools had for video guys. Some of them didn’t really have the background in football at all, they were all journalism guys or whatever. BC: Yeah, they probably knew more about the other side of things than we did, but I think it was probably an added benefit to the coaches that we understood, that we could enter the information or edit something easier just by knowing what everything was. Even the drills, you know? We’d done them all. Q: Right. Thousands of times. (laughs) Now, I want to tell you, I try to ask everyone if they can name someone behind the scenes who played a large role, who maybe never got their due or were too far behind the curtain, and yours and Moose’s name have come up a few times, Bryan. My guess is that you two made the coaches’ time extremely efficient, which allowed them to master other aspects of their jobs, like teaching, recruiting, personnel issues and, heck, even more family time. What do you think about that notion? BC: I think it just helped that they didn’t have to sit there so long. We gave them exactly what they wanted, they didn’t have to ask, “Hey, I need to see this. I want to see what this play looks like.” They didn’t have to do anything about what a play was, what this formation was, what a front was, they knew it by looking at what we put together. And doing that helped make you feel like you were really a part of what was going on. BC: They could rely on you for the video cutups, all the formations against the fronts, et cetera. If I saw one that didn’t look like it was right, I knew it and I could change it. And Moose was the same way, probably even more so than me. 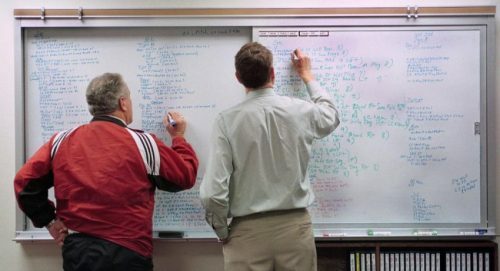 He was involved in some of the stat work and things during games, so he would help a little bit more in breaking down the film even more, eventually. That was a really big bonus for the defensive guys, where you had one more set of eyes looking at something. You had another guy in the office saying, “Hey, every time you do something, this is what happens with them. Look at this.” They just had somebody else to talk to about it, someone who had an opinion. Q: Just like you said, “an extra set of eyes,” scrubbing the info and making sure the breakdown was cut up and labeled properly so the coaches could really go to town when it came to game planning. And when you talk about entering information, when were you entering and how would you enter it? 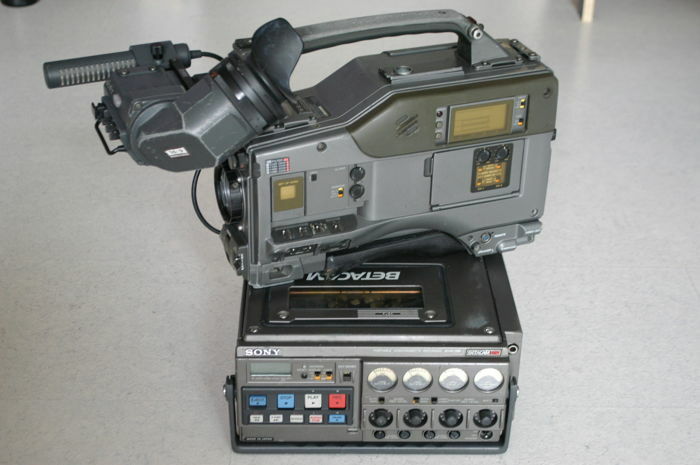 BC: Well, you’d take the film -you filmed in Betacam format- and you’d take that tape and you would basically have to put it into digital format first. So it would be on a computer hard drive, then you would have to mark where each play starts and stops. Basically, ‘Here’s the play.’ So when you’d break the film down by each play you’d have to enter all the information of each play; so it would be: 1st and 10 at the twenty, Pro Right is the formation, the front is the 50 Front and they ran a slant, they had Cover Two.” You had to enter any information that tagged along with the play and match it up with the play. So once you did that you could come out with a bunch of different reports that would indicate tendencies like, ‘Every time it’s second and long those guys are blitzing weak,’ or whatever. There was all sorts of things a guy could come up with. 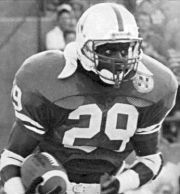 And then sometimes the coaches could say, “Here’s what I want to see…” You had some basic reports that everybody got and then you had some different plays, like Frank Solich might want some different things than Ron Brown wanted to see. So you had to put together little packets, customized packets of information and video tape for all these guys, for them to look at so they could game-plan together. Q: As an example, what would Frank ask for? BC: They all had so much stuff. (laughs) For example, it would be like this: when they might meet together as a staff Frank Solich might be in charge of blitzes or something, or a coverage. Frank and Ron would maybe get together and make sure they had everything covered for a coverage, and then Milt and Dan were responsible for line play and all the stunts, defensive line blitzes, slants, whatever. Those guys would have to have that information when they met with Tom, all of them together. So they’d split every little piece of it up. Like I said, Dan had the defensive line to consider, so we would have to come up with all kinds of tendencies and things, reports to look at. It might have been Ron and Turner had the secondary and Frank might have had the linebackers and tendencies. So they would get together in meetings and draw something up: “Here’s what they do when they do this. Here’s their front, their basic fronts. Here’s how the linebackers line up all the time.” They’d kind of piece it together. BC: Yeah, Turner and Ron might want to see a lot more coverage things. They’d look at the other things, but not quite as in-depth. They’d be, “When teams come out with this set they’re always in this kind of coverage,” or, “They always played ‘press’ on this guy, so when they do this we might run a slant or something.” Things like that. It was kind of a fun job because you could kind of see it every week: what you were doing, you could see it go into action.